Do you remember a couple weeks back when I told you about my current favorite lunch? You know...tabouli and hummus on flat bread? Well, the other morning I pulled out my food processor, peeled the garlic cloves, picked the parsley and had Sadie pluck the parsley leaves. We were out of hummus and I needed more. In a couple days we were taking a day trip to a nearby lake and I was lining up our packed lunch. I went to the fridge and before I even opened the door I remembered that when I made hummus the week before, I used the rest of the tahini. (If you remember, tahini is sesame seed paste.) Our non-chain grocery store doesn't carry tahini. In order to get more, I would have to drive all the way across town to the natural foods store. Go that far for one item? That's not me. So instead I got online and pulled up a recipe. It called for only two ingredients. Sesame seeds and olive oil. The recipe I found called for 5 cups of sesame seeds. Well, I knew I didn't have that many. Who has 5 cups of sesame seeds on hand anyway? If you do, please tell me why- I'd like to know. I scrounged around and found one cup, adjusted the recipe and commenced. 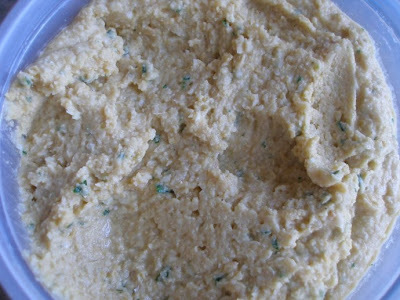 We were surprised to find that this batch of hummus (with the homemade tahini) was hardly distinguishable from previous batches. If you are lucky enough find bulk sesame seeds at a cheap price, this ends up being very cost effective in addition to saving you in a pinch. This recipe makes about 12 tbsp. 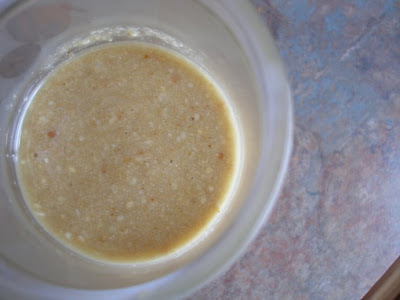 of tahini, enough for two hummus recipes. The recipe I found called for toasting the sesame seeds in the oven. Um, no. Not in the middle of summer. I sprayed my non-stick pan with cooking spray and toasted the sesame seeds over medium high heat- stiring constantly to keep them from burning. When they start to turn light brown, remove them from the heat, continuing to stir a bit until they stop toasting. Let them cool, then put them in your food processor along with 1/4 cup of olive oil. Process them, adding more olive oil if needed. The consistency you are looking for is that of store bought tahini. If you're not sure what that is like, aim for all natural peanut butter consistency. And, if you're still not sure what I mean, try for the consistency of what creamy peanut butter becomes when it's spread on hot toast. It becomes even creamier. Store the tahini in a jar with a tight fitting lid (in the fridge). Thank you for the tahini recipe...how long will it last in the refrigerator? or can it be frozen for longer periods of time? Good question, Jessica. I just checked what I have stored in the fridge from when I made it and wrote this post (in July) and it still smells fine. Since it's preserved in olive oil it's keeping well thus far:-). Hey there! So I have a hand turn food processor (thank you tupperware!) so it's all my own elbow grease and I'm not sure how long to continue doing this. I definitely have paste but I still definitely have some seeds. Do all the seeds go away when you make this? Should I continue turning? Very cool, I'm thinking about trying this after looking at the $8 jar of tahini at the grocery..
Wow talk about timing! I am cleaning out and rearranging our kitchen cabinets when I can across a bag of sesame seeds I forgot about. See we do have a source for bulk sesame seeds which is pretty inexpensive and I had a coupon on any bulk food item. Well you know the story.... they were bought only to be forgotten about which is why I am reorganizing our cabinets!! Thank you so very much! Now I'm off to make tahini and then red beet hummus since no one in may family like red beets but we ended up with quite a few in our last CSA share.